As the head chef of Petrossian in West Hollywood, Benjamin Bailly (@ChefBenBailly) is encouraged by management to highlight caviar, foie gras, and smoked salmon in nearly all of his dishes. During a previous meal here, we were served an avalanche of fish eggs. Whether mounded atop little blinis or served in a fashionable tin with King crab meat, the amount of caviar gracing our table was enough to satisfy even the most demanding of Russian tsars. While cooking with the world’s finest luxury products is hardly a chore, these ingredients tend to limit the kitchen’s range. At the encouragement of a trio of food-loving pandas [Kung Food Panda, Two Hungry Pandas], Chef Bailly exchanged his usual high-end creations for homey comfort foods during one evening in late August. For a single dinner service, the dishes coming out of Petrossian’s kitchen were no different than the ones served in the Chef’s home. Dinner began with a glass of bubbly and two fried “snacks.” The buttermilk fried frogs legs were meatier than expected and expertly fried. The nearly equal ratio of meat to batter was definitely a plus. Laced with fresh tarragon and tart relish, the tartar sauce was a lovely complement. 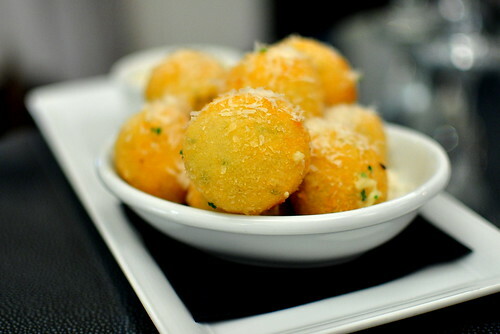 The second “snack” to arrive was truffle pomme (potato) croquettes with parsley and Parmesan. The silky innards were spiked with truffle oil and enrobed in a golden crust. The standout texture reminded The Astronomer and me of the bitchin’ croquettas we hoovered up in Spain. 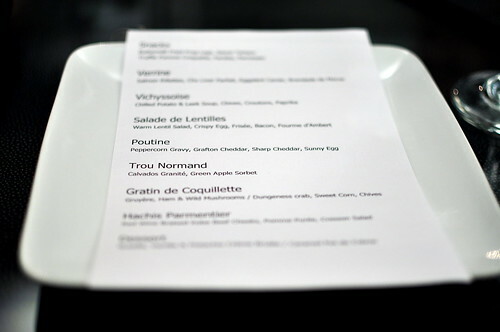 My favorite course of the night was a series of four “verrines” served with toasted brioche and baguette rounds. I couldn’t keep my paws away from the ones filled with warm brandade de morue (salt cod dip) and eggplant caviar. 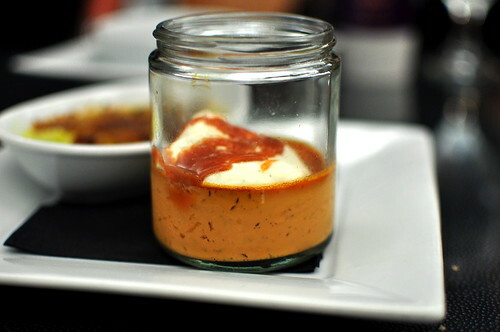 My dining companions went gaga for the chicken liver parfait layered with a sweet port gelee. 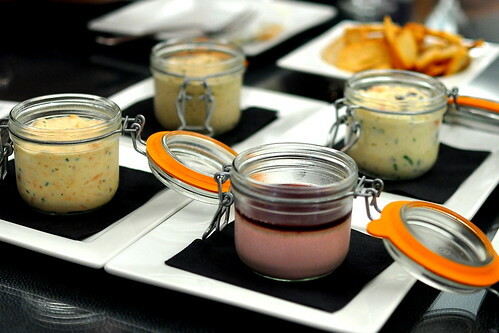 The salmon rillettes were loved as well, but not as moreish as the rest. With seven courses yet to be served, I had to exhibit restraint to keep myself from licking the jars clean. 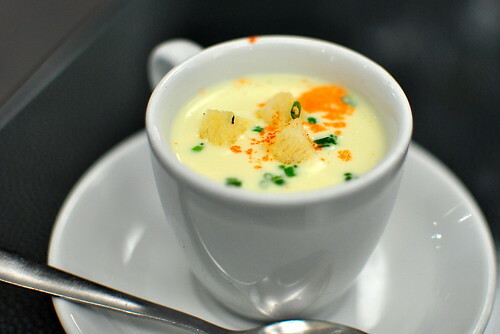 Fortunately, the next course was a small shot of “vichyssoise.” Accented with chives, croutons, and paprika, the chilled potato and leek soup was smooth, creamy, and irresistible. 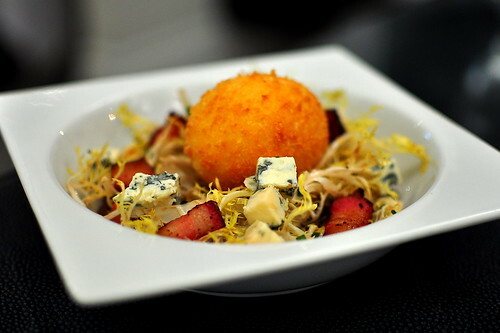 The following course was a gorgeous “Salade de Lentilles” topped with a crispy egg, frisee, bacon, and fourme d’Ambert (pasteurized cow’s milk blue cheese from the Auvergne region of France). The richness of the runny-yolked egg and thick bacon bits were reeled in by the bitter tumbles of frisee and warm lentils. Taking a short break from French comfort fare, Chef Bailly served his take on “poutine” at the request of Danny and Wesley. 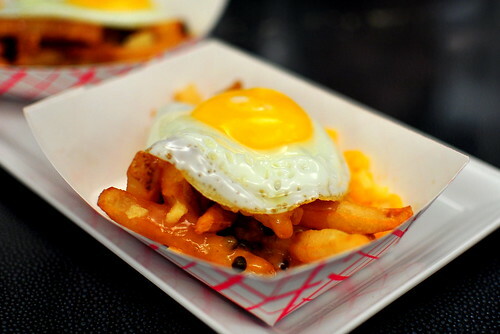 His version consisted of skin-on shoe string fries slathered in a peppercorn gravy, topped with Grafton Village cheddar from Vermont, and finished with a fried egg. I was hoping for some squeaky cheese curd action, but alas, it wasn’t meant to be. Before the final courses arrived, we sipped a “Trou Normand.” A trou normand, or “Norman hole,” is a pause between courses in which diners drink a glass of calvados (French apple brandy) in order to improve the appetite and make room for the next course. 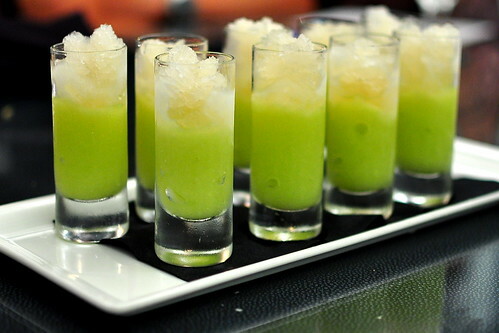 Chef Bailly’s version was a refreshing and slushy combination of calvados granita and green apple sorbet. The potent shot jolted the senses and readied the palate for more. The penultimate course consisted of two “Gratin de Coquillette,” better known as cheesy noodle casseroles. One was made with gruyere, ham, and wild mushrooms, while the other consisted of Dungeness crab, sweet corn, and chives. Both were decadent as heck and so very cheesy. It’s nice to know that the French are comforted by mac and cheese too. The final savory course consisted of red wine braised Kobe beef cheeks layered with pomme puree (not pictured). 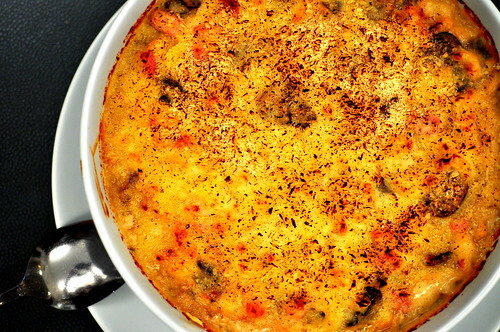 “Hachis Parmentier” is considered the French equivalent of cottage or shepherd’s pie. 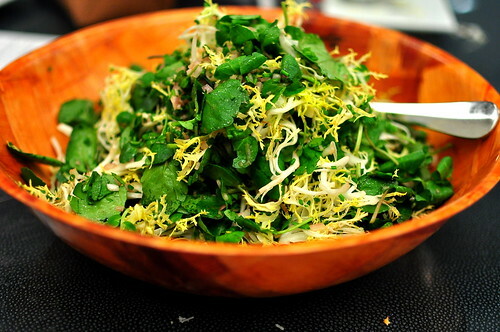 On the side was a lightly dressed watercress and frisee salad to balance the onslaught of heavy flavors. I was completely and utterly stuffed at this point and could only muster one tiny bite. Had I not eaten a silly amount of food beforehand, I am confident that this course would’ve comforted my tender meat-loving soul. …and a caramel pot de creme. I barely had room for one bite of each, but dang, it tasted good going down. Thanks for spoiling us, Chef. Small girl. Big camera. HUGE appetite. “Salade de Lentilles”? More like Salade de my sweet dreams. oh how i love your pics. man, i can eat that chicken liver parfait again.and again.and again. still burping from this meal…..
Great pics Cathy (overhead shot ftw!). 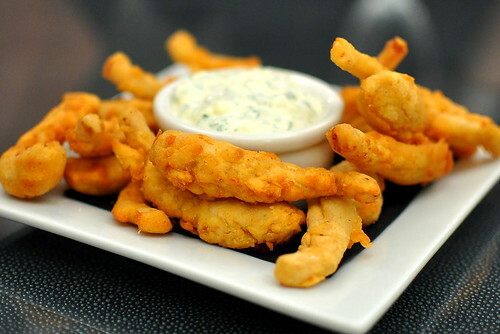 Thinking of the verrines makes my mouth water. Wow that is a great sounding dinner! It times like those that you wished you had and extra stomach to eat everything! Holy smackeral! That all looks so so so SO amazing! I’m starving now! 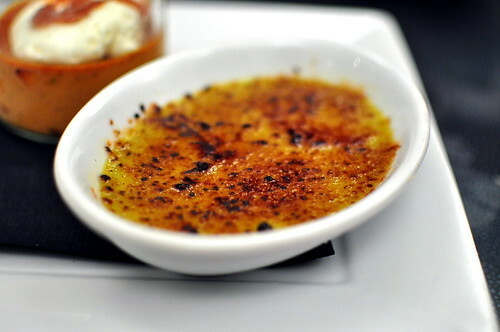 That caramel pot de creme looks intense! in a good way, of course. i pass this place all the time and have been meaning to go. these pictures have totally convinced me!